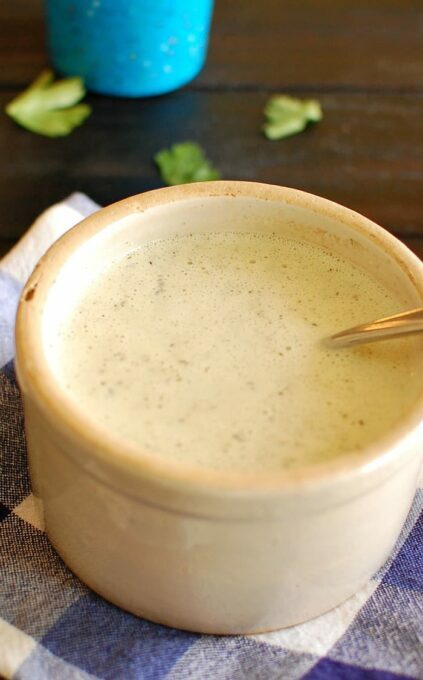 Creamy garlic sauce is easy to make and tastes great on meats and vegetables. The recipe uses simple ingredients and the garlic sauce can be made in 30 to 35 minutes. Wow! 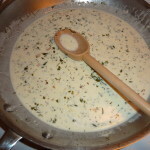 Creamy Garlic Sauce…Yum!! It has been a long time since I’ve posted a new recipe or meal. Life has been hectic lately since we found a buyer for our boat and had to move all of our stuff off the boat. I’m happy and sad at the same time. My dream of being on the water was something I’ve had for years. We got to experience it and lived on the boat for two years and had some great experiences. Time to move on. In the past two or three weeks I’ve made some killer meats and menus, but haven’t had the time to post the photos and recipes. Hopefully, I’ll have time to keep up now. Mary Jo picked up some pre-made Key West Pink Shrimp Ravioli at the seafood market the other day when she also bought us a nice grouper filet. (By the way, the grouper was fabulous). The ravioli is prepared by boiling the frozen pieces in water for 6 or 7 minutes. What we needed was a good garlic sauce to go with the ravioli and this was easy and excellent! This is Creamy Garlic Sauce, inspired by Robert Irvine of the Food Network. Robert seems to always keep things simple but he always brings out the best flavors in foods. In a skillet on medium heat, add olive oil, garlic and shallot. Cook for about 5 minutes until the shallot is soft. Then add the wine, parsley, basil and thyme. Cook this until the wine has reduced by about ½, which takes about 10 minutes. At this point you could strain the sauce with a fine strainer and it would make a smooth sauce. Mary Jo and I thought this would be nice if you were having company. We didn’t strain ours and had small herb and shallot bits in the sauce. (I later made this again and put the sauce in a blender to make a smoother sauce and this worked really well). Turn up the heat a bit and add the heavy cream. Cook this for another 5 minutes until the sauce starts to thicken. Taste the sauce and add salt as needed. I added about a half teaspoon. Served right away with the ravioli. 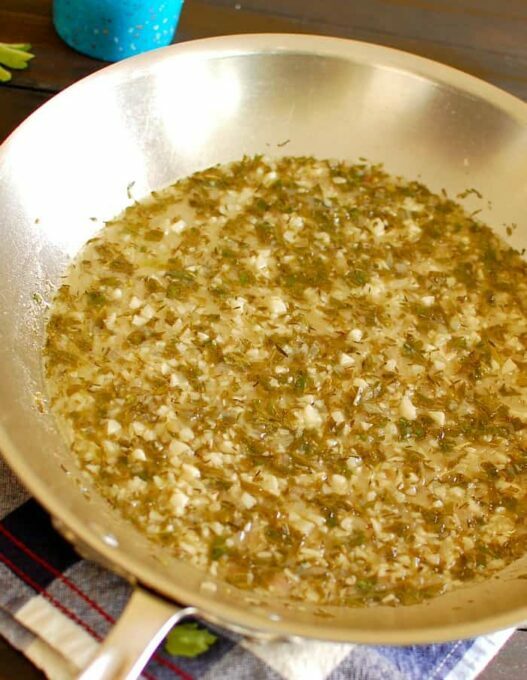 You could use this sauce with any food that is good with garlic. Just about any seafood and it would be great on vegetables. 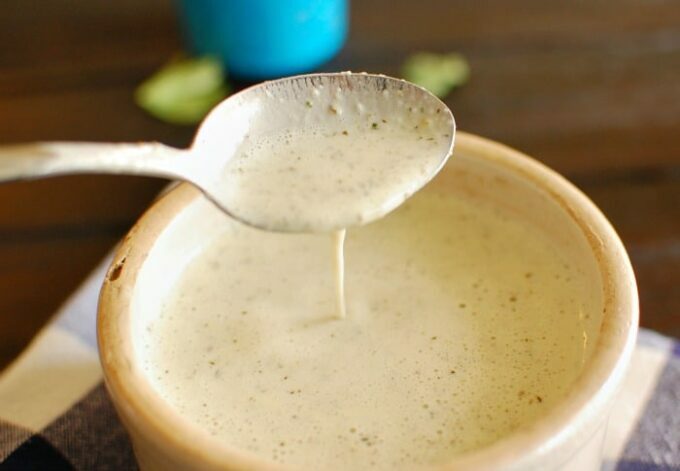 Try this Creamy Garlic Sauce and let me know what you think. 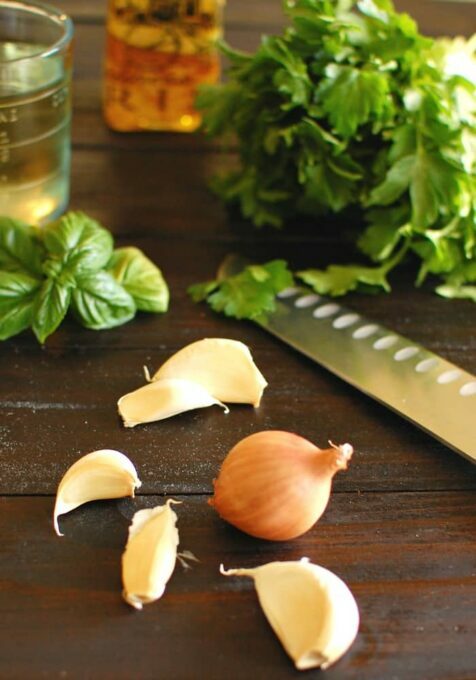 Garlic sauce to use on meats and vegetables. In a skillet on medium heat, add olive oil, garlic and shallot. Cook 4 to 5 minutes until the shallot is soft. Add wine, parsley, basil, and thyme and cook until the wine has reduced by half, 10 minutes. Strain the sauce with a fine strainer if desired. Turn the heat to medium high and add the cream. Cook this for 5 minutes until the sauce starts to thicken. Taste and add salt if necessary. Serve warm. 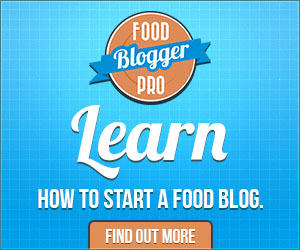 To make a smoother sauce, place in a blender for a minute. Hi Joe. I like the recipe. How long can I store this in the refrigerator? Hi Fancy…I have always used it right away but I would guess that it would last a week in the refrigerator.